We actually went 3 for 3. I don't know how long it has been since we did a perfect day finding 2 or more caches. It has been quite awhile. First up was "St. Mary's Cache". The trail up to St. Mary's Glacier was full of muggles, and I did not know how we would find anything without attracting attention. I was happy when the GPS sent us off on a side trail. But, we soon realized that we were walking towards a campsite. Luckily, the cache itself was down a hill where we were (probably) not noticed. \My wife found this one almost immediately, but let the kids find it on their own. My oldest got the honors. This was the biggest and easiest cache of the day. There was nothing in the container that the boys liked, but they kindly left some stuff for future kids to trade for. It is amazing how much junky small little plastic toys we have in our caching pack. The second cache we found was Chase and Teel's Camo-Sized Adventure. It was only about .15 miles away from the first one. Again, this was well enough off the trail that we could work without arising suspicion from the muggles in the area. This one was smaller and a bit more difficult than the first one, but it didn't take us very long before my youngest found it. All that was in this container was a log book, which we signed. Again, the kids put a couple small toys into the cache for future kids. Nice that the toys we have range in size for all kinds of geocaches. Our third and final cache of the day was called "In Honor of St. Twila at St. Mary's". This was another small one, and the most difficult find of the day. The hiding spot itself wasn't bad, but the GPS was really wonky, for whatever reason, in this area. It told us it was a certain distance in a certain direction. Once we were there it told us it was the same distance in a totally different direction. If you geocache at all, you probably know how that goes. Plus, we were right in an area where lots of people walk by, so we had to "act casual" the whole time. Eventually, I found the cache and sort of steered the kids toward it. Once we found it, it seemed pretty obvious. This was the same size as #2, and again it only contained the log. Once again, the boys left some toys for the next group that found it. After this, we headed over to the lake. It is really pretty, and has lots of rocks. The boys, as you can probably imagine if you have kids (especially boys), really like throwing rocks into water. It is something this can do for hours. Panarama. Click on this for bigger picture. My wife. The hottest woman up there. 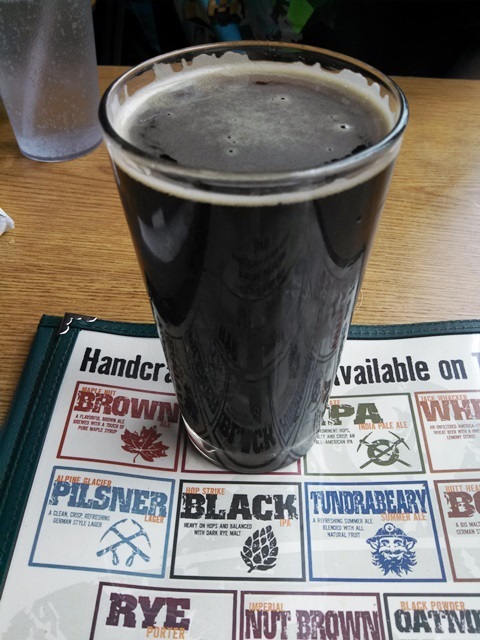 We didn't bring a lunch because we were so close to Idaho Springs that we had to stop by Tommyknocker Brew-pub for lunch. We ended up having a 20 minute wait on top of getting there pretty late, so our lunch was later than we would have ideally eaten, but the it was fun. Of course, I had a few beers, including Tommyknocker's Hop Strike Black IPA, which has been showcased on this blog as part of my Colorado 6 Pack (make sure you check that out). What a wonderful day of fun! Kids go back to school Monday.